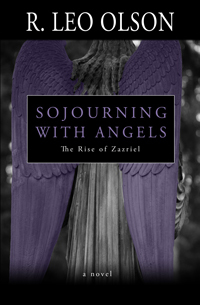 NOVEL – SPIRITUAL FANTASY: Religious history is filled with stories of angels, good and bad, interacting with us. My own sister claims one of these interactions during a car accident. Religious history, from ancient paganism, Egyptians, Vikings, Zoroastrianism, Hinduism, Judaism, Islam, to Christianity are also filled with stories, rituals, and visions of these same angels -good and bad- involved in the soul’s journey from this life into the next. There seems to be an intermediary existence- they all have teachings about this: Excarnation (being eaten) by birds, purgatory and all kinds of fantistical processes. Eastern Orthodox Christianity’s Aerial Toll Houses is by far the most interesting to me. I had this idea of a Guardian Angel charged with caring for a not so saintly guy who dies. And there is phrase in the New Testament that states a husband can be sancitified (saved) by a god-fearing wife. These two thoughts and years of blending religious research birthed this mystical love story. I still find parts of human religious history and angels fascinating and unsettling. If we actually do Sojourn with Angels now and after this life then I hope it resembles something this. Plus, I still break down in tears during parts of this story and I wrote the damn thing.